Last week we learned about a fun dog tricks Facebook group from DZ's Adventures called 2016 Dog Trick Challenge. It sounded really fun so we promptly checked it out, and today we're sharing what we did this week! This week's challenge was to find a prop your dog hasn't interacted with before and train two different behaviors. The hardest part for me was thinking of a prop since we already use so many household items as fun props. I landed on a tissue box, thinking this could be a useful skill if I have a cold and don't want to get up off the sofa. I can just send Rocco to get me a tissue! ha! Of course, I completely forgot about the Havanese gene that requires all Havanese to shred paper of any kind. In spite of that, Rocco actually did pretty well with this challenge. Here's the first behavior... pulling a tissue out of a box. And here's the second behavior, bringing a tissue to me! What rocks about dog tricks? We love doing dog tricks and here are a few reasons why. Helps build focus and motivation to do other activities with you ... like agility! What do you love about dog tricks? I saw this on your FB yesterday - excellent...and great for the cold and flu season coming. I'm re-thinking the wisdom of teaching this trick. On the other hand, Rocco is pretty short and it's unlikely I'll be storing tissues where he can reach them. He'll also bring the entire box.... which may be safer! Dog tricks. Well, we have a new adopted puppy in the family, a German Shorthair Pointer mix named Forest and he is every bit his his breed. He learns real fast. Playing fetch is always fun. It gives us a chance to interact with him and since he needs lots of exercise, doing tricks like this is great for that. Teaching him to sit was almost immediate. :-) It's fun! It is fun! That's great that you're doing lots of things with him! Congrats on your new puppy. Thanks, you too! It will be helpful with flu season and all! What a great idea! I would love if my dog could fetch any thing! Schooner is our shredder! You can't put down your napkin, newspaper, tissues, wrapping paper because he will shred it so fast! He shreds and then he walks around for you to clean up the mess. hehe! It's interesting, because Rocco is a shredder too. I think that teaching him a specific behavior -- pulling the tissue rather than shredding -- helps! It rewards him for the non-shredding behavior! I'd love it if Earl and Ethel could do this! That is a cute trick. I like to shred tissues, so I don't know if it would work for me, but it sure works for Rocco! Rocco's a big time shredder too, so I think it's possible to teach the behavior and reward the pulling without the shredding! Achoo! Mr. N will do this trick but he prefers bringing me packs of tissues. He doesn't like the texture of tissue in his mouth! Packs are a good idea! This is a wonderful trick! I enjoyed watching the videos. I love this trick!!! Missy shares Rocco's paper-shredding-gene, by the way...which is why I never would have thought of teaching this trick. Thanks for the idea!! hehe! It's fun, but be prepared to go through an entire box of tissues! 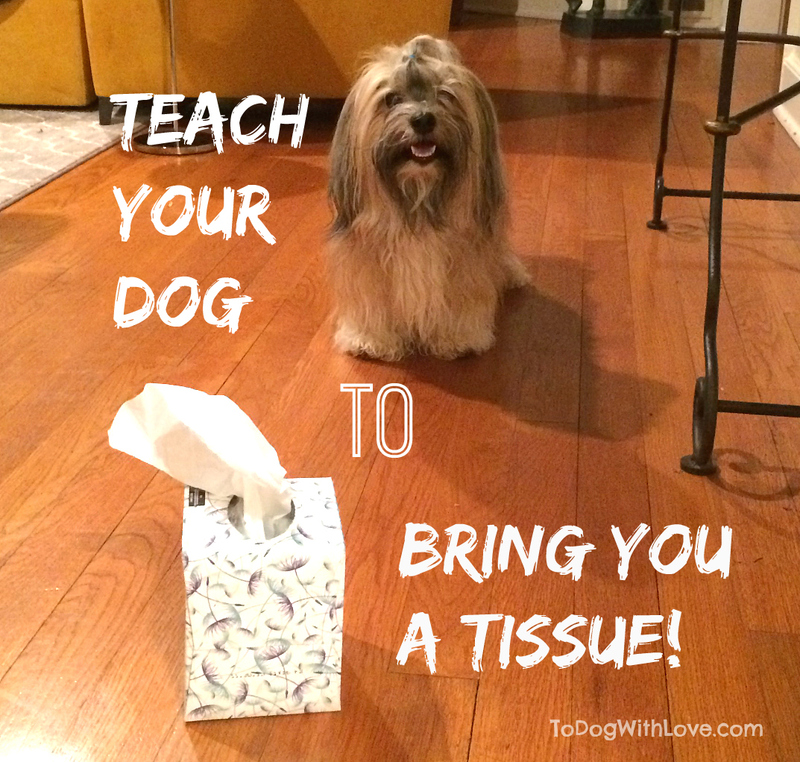 Great job Rocco, I won't be teaching my gang that as they love tissue and eat it any chance they can get. I think we'll save this trick for special occasions! Fortunately, Rocco can't reach the tissue boxes ... at least not where they are typically kept. hehe! Rocco is actually obsessed with the little cardboard tubes inside of toilet paper. He'll try to fish those out of the trash! Fun idea for a trick. Great job.